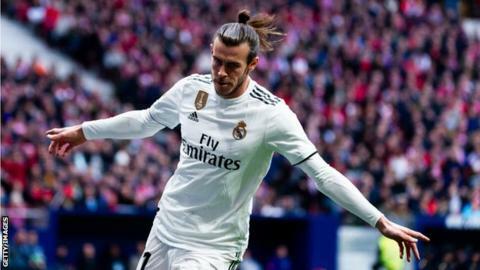 Real Madrid forward Gareth Bale will not be punished by the Spanish Football Federation (RFEF) for his celebration during the 3-1 la Liga victory over Atletico Madrid earlier this month. Bale, 29, raised his bent arm and hit it with his other hand, a gesture that is considered offensive in Spain. La Liga had filed a complaint against him for the "provocative gesture". In a statement, the RFEF said it had not "found a breach of the rules of the game or action deserving either warning or disciplinary action". The decision means Bale is available for both El Clasicos against Barcelona this week. Real welcome Barca to the Bernabeu in the Copa del Rey on Wednesday at 20:00 GMT, before again facing them in the league at home on Saturday.